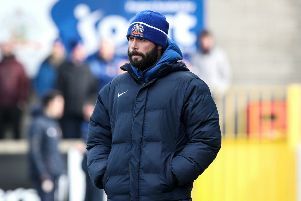 Glenavon’s James Singleton suffered a broken leg in Northern Ireland’s U21 Euro qualifier with Macedonia at Mourneview Park on Tuesday night. The 20-year-old, earning his second cap, hit the ground in obvious pain after getting caught in a challenge on 64 minutes. James Singleton in action for Northern Ireland before suffering a broken leg. Pic by Presseye. His left foot was in a brace and he was receiving oxygen as he was stretchered off and taken to an ambulance and on to hospital for an x-ray which revealed he had suffered a broken leg and he will be out for some time. The game, watched by senior team manager Michael O’Neill, ended in a 2-1 defeat for Northern Ireland. “I thought it was a disgraceful tackle,” said U21 manager Jim Magilton. Things had looked good for Magilton’s side as they took the lead just before the break. After soaking up a lot of pressure a corner by Darren McKnight was nodded back by Liam Donnelly and Josh Doherty nipped in to head past the keeper on 44 minutes. Macedonia hit back within seconds of the restart and after Singleton departed they hit the front on 85 minutes and held on for the win. Both the IFA and Glenavon fans wish James a speedy recovery.